The link leads to a compilation of papers on Geogineering in Earth's Future entitled: "Crutzen +10: Reflecting upon 10 years of geoengineering research". The compilation includes a lot of papers that cover a wide ranges of topics and perspectives. My only comment is that when many denialists believe that geoengineering will be implemented then they are prepared to admit that climate sensitivity is high so that they can demand a lot of geoengineeing. Summary: "The year 2016 marked the 10 year anniversary of Nobel laureate Paul Crutzen's seminal 2006 contribution on geoengineering, “Albedo enhancement by stratospheric sulfur injection: A contribution to solve a policy dilemma?” Crutzen’s paper in climatic change sparked an unprecedented surge of academic, public, and political interest in geoengineering. This collection comprises research and commentaries from leading experts in the field of geoengineering on the development of the discussion over the past decade and to consider where it may be going in the next 10 years." In the linked reference the author voice their opinion that China will not unilaterally implement geoengineering, but they offer what they believe to be lessons learned from China's long history of manipulating the environment, so that the world community will be able to act more according to Chinese thinking when it decides to implement geoengineering when our communal situation become sufficiently desperate. Abstract: "Over the last 30 years, China has industrialized more rapidly than any other society in history and become the world's largest emitter of CO2. This has demonstrated unprecedented ability to change the socioeconomic landscape, produced great wealth, and led to some catastrophic environmental damage. This is the background that has motivated several authors to postulate that China would initiate geoengineering using solar radiation management. But will China be the first to pioneer climate engineering? The answer, we argue here, is likely to be “no!” We reach this conclusion from an analysis of the historic philosophical tradition that informs the Chinese world view, China's experience of mega-engineering projects both ancient and modern, and the policies implemented over the last 60 years. The debate on geoengineering has to-date been almost exclusively Euro-American, but China has mega-engineering experience, huge resources, and a radically different world-view that needs to be acknowledged. Furthermore we contend that these experiences can be useful internationally in helping to frame the debate on climate mitigation from the perspective of the earth as shared, multiuse and finite." "Could a £400bn plan to refreeze the Arctic before the ice melts really work? " Proposed wind pumps to bring water up to the top of the ice, increasing ice thickness. "[It] may become necessary if we want to halt the calamity that faces the Arctic, says Desch, who, like many other scientists, has become alarmed at temperature change in the region. They say that it is now warming twice as fast as their climate models predicted only a few years ago and argue that the 2015 Paris agreement to limit global warming will be insufficient to prevent the region’s sea ice disappearing completely in summer, possibly by 2030." 20 + years ago I worked on some environmental projects in SW China. There was a widespread belief that the big environmental problems building up from 10+ percent annual economic growth could be fixed later. " Man can fix nature to man's requirements." Talk about being a prophet in the wilderness. Maybe by now the decision-makers in China are more cautious ? We will see. Geo-engineering scares me witless. Natural systems are just too complex - unforseen consequences rule, OK? It's not meant to be, and perhaps it's just my way of dealing with the stress, but I found this article to be hilarious. The best stuff is in the accompanying audio. I won't even begin to opine on why this is a non-starter, because I likely won't stop. I'll leave it up to the forum to decide on the motivation for such a hare brained scheme. The linked article is entitled: "Biomass subsidies ‘not fit for purpose’, says Chatham House". It raises major doubts about the use of biomass to fight climate change. Extract: "Subsidies should end for many types of biomass, a new Chatham House report argues, because they are failing to help cut greenhouse gas emissions." Edit: I noted that in the Science folder and the associated "Modelling the Anthropocene" thread, I provide posts about references how how to model climate attractors; while in the Consequences folder and the associated "Conservative Scientists and its Consequences" folder I provide several posts that relate climate attractors to both observed & paleo data. "... climate attractors amplify climate sensitivity above what it would be otherwise ..."
I do not understand. Climate trajectories explore the phase space in the attractor's basin of convergence, the climate sensitivity is only properly defined within that basin. The stucture of the attractor defines the sensitivity, and i do not understand what "amplifies" means in this context. What could go wrong ? Well, some yahoo like me with a balloon an a bag of talc could cause drought in the Sahel. Naaa, never happen. What I was rather clumsily trying to say is that as computer power is limited, current state-of the-art Earth System Models are not properly follow chaos theory (using the phase space in the attractor's basin), and as they are unlikely to be able to do so for many decades (well after my estimated socio-economic collapse in the 2045 - 2060 timeframe); I recommend that AR6 not only recalibrate their ESM response sensitivities, but that they also include discussions about key climate attractors like for example ENSO (which is dependent on both phase relationships of multiple feedback mechanisms and on initial boundary conditions). I use this as an exampled as there is plenty of evidence that aerosols over the Tropical Pacific have a major impact on ENSO (& I believe that an increasingly El Nino-like ENSO will not only directly increase GMSTA but will also accelerate Arctic Amplification) and thus localized control of aerosols over the Tropical Pacific may be able to blunt feedbacks that may drive ECS towards 5C this century (see the middle panel of the attached image by Andrew from the 2015 Ringberg Workshop). Edit: I provide the second image of ECS from various different paleo-eras, to demonstrate the ECS is not a fixed number but is dependent upon the level of activation of the various feedback mechanisms under different climate conditions. By 2040, we will be employing all manner of geoengineering techniques in a desperate to attempt to halt warming with disastrous results. Can't wait for the New Little Ice Age of the 2070's that led to worldwide famine, brought to being by the geoengineering trials of the stratospheric aerosol injections. Followed by the rapid warmup of the 2080's when the aerosols washed out. He has called for a multi-phase plan to fund research and conduct real-world testing within 18 months, deploy massive stratospheric spraying three years after, and continue spraying for a century, a duration geoengineers believe would be necessary to dial back the planet’s temperature......"
I am intrigued with the part of the geoengineering experiment that utilizes calcium carbonate . Is it time for scientists to begin geoengineering-related experiments in the open air? Keith stresses that it’s too early to say whether any geoengineering technologies should ever be deployed. But he has argued for years that research should move ahead to better understand their capabilities and dangers, because it’s possible they could significantly reduce the risks of climate change. He stressed that the experiments would have negligible environment impacts, as they will involve no more than a kilogram of materials." We should keep some perspective on the difference between an experiment and full scale geoengineering implementation . We do on a regular basis shoot rockets into space. I am quite sure those rocket launches inject tons of emissions into the stratosphere. A kilogram of calcium carbonate is harmless in comparison . Abstract: "Over the coming century humanity may need to find reservoirs to store several trillions of tons of carbon dioxide (CO2) emitted from fossil fuel combustion, which would otherwise cause dangerous climate change if it were left in the atmosphere. Carbon storage in the ocean as bicarbonate ions (by increasing ocean alkalinity) has received very little attention. Yet recent work suggests sufficient capacity to sequester copious quantities of CO2. It may be possible to sequester hundreds of billions to trillions of tons of C without surpassing postindustrial average carbonate saturation states in the surface ocean. When globally distributed, the impact of elevated alkalinity is potentially small and may help ameliorate the effects of ocean acidification. However, the local impact around addition sites may be more acute but is specific to the mineral and technology. The alkalinity of the ocean increases naturally because of rock weathering in which >1.5 mol of carbon are removed from the atmosphere for every mole of magnesium or calcium dissolved from silicate minerals (e.g., wollastonite, olivine, and anorthite) and 0.5 mol for carbonate minerals (e.g., calcite and dolomite). These processes are responsible for naturally sequestering 0.5 billion tons of CO2 per year. Alkalinity is reduced in the ocean through carbonate mineral precipitation, which is almost exclusively formed from biological activity. Most of the previous work on the biological response to changes in carbonate chemistry have focused on acidifying conditions. More research is required to understand carbonate precipitation at elevated alkalinity to constrain the longevity of carbon storage. A range of technologies have been proposed to increase ocean alkalinity (accelerated weathering of limestone, enhanced weathering, electrochemical promoted weathering, and ocean liming), the cost of which may be comparable to alternative carbon sequestration proposals (e.g., $20–100 tCO2−1). There are still many unanswered technical, environmental, social, and ethical questions, but the scale of the carbon sequestration challenge warrants research to address these." See also the associate article entitled: "Preventing Climate Change by Increasing Ocean Alkalinity". Extract: "One method is enhanced weathering which is the application of rock powder to terrestrial, coastal, and open ocean environments. For instance, some have proposed distribution of crushed silicate rocks to tropical cropland. The wet and warm climate of these environments would be conducive to dissolution, the products of which would be transported via rivers to the ocean." Late last month, about 100 researchers from around the world gathered at Logan International Airport in Boston. A fleet of buses appeared to whisk them to a remote and luxurious ski resort in northeastern Maine. They met to talk, drink, and cogitate off the record for five days about a messy solution to one of the world’s most challenging problems. They had gathered to discuss how to provide humanity one last line of defense against catastrophic global warming: solar geoengineering. So let me see: we must screw with the radiation balance with unknown effect to fix screwing with the radiation balance with definitely deleterious effects. Yeah, this is killing me. Let's find expensive and risky solutions to alcohol-induced illnesses, and try them on our children, as we don"t want to stop drinking. My only comment is that when many denialists believe that geoengineering will be implemented then they are prepared to admit that climate sensitivity is high so that they can demand a lot of geoengineeing. I believe this has been the plan all along. They planned to burn as much Fossil fuels as they can sell, and once the climate looked to be at a breaking point, force geoengineering solutions. Basically, they gambled the life of everyone in the world for a few bucks. Climate change deniers won the climate change debate years ago. The time ran out to avoid great damage just by removing CO2 from the atmosphere. Right now it is geoengineering or the end of civilization as we know it. Just like the fossil fuel interests wanted. Sadly, I have to agree with you Archimid. The more I read about geo-engineering, the more unknowns and risks there seem to be, but it does look like the path we are on. Even if we manage to eliminate fossil fuel use by 2050 (or even 2040) we will still need some way to pull some of the carbon back out of the above-surface carbon cycle. Throwing up a sunshade would be, at best, a band aid that could buy us a few years respite from extreme temperatures (and temperature driven superstorms). But it wouldn't reduce the amount of carbon in our oceans. I think we need to develop the sunshade but with very clear understanding that it is not a fix. Biochar, burying logs, grinding up carbon absorbing rock in order to expose more surface area - that seems to be all we've got right now and none are stuff that get's me excited. Maybe we need some heavy (global) funding to see if a few of the billions of us can think up something better. It is probable that by 2040 the WAIS collapse may have reached a tipping point. If so, then no amount of geoengineering will be able to stop its collapse. So true. With a CO2e level of 520+ (much higher is we use the gwp20 # for methane) we are risking many, many different feedbacks in the next couple of decades. Ocean acidification and the WAIS just being two of them. Plus a general destabilization of weather patterns that could be made worse by geo-engineering (e.g. the geographical movement of/failing of the Indian and African monsoons). 2. The ocean's thermal inertia and the increasing frequency of super El Nino events (which warm the world). 3. The re-occurrence of the positive phase of the AMO circa 2035 to 2045, which could drive warm North Atlantic water deep into the Arctic Ocean basin (see the attached image), which might trigger pulses of methane emissions from relatively shallow water marine methane hydrates. 4. If the WAIS were to begin collapsing circa 2040, then circa 2050 to 2060 major pulses of methane from Antarctic marine methane hydrates could occur. 5. The occurrence of regional extreme weather could over stress land vegetation, which could reduce the CO2 absorption from these plants. 6. Continued acidification of the Oceans could reduce the amount of CO2 that the Oceans absorb. 7. Rising sea levels (particularly if the WAIS collapses), would drive salient many miles into the landward groundwater, which would kill the vegetation in this coastal regions. 8. Positive feedback from wars caused by changes in regional weather patterns caused by the geoengineering. These are just a few of the many positive feedback mechanisms that geoengineering might not address. If we were around 50-100 years more advanced in the field, I'd think that bio-geoengineering would be the way to go. We already look to living organisms to extract carbon from the atmosphere - is there any chance that we could engineer critters to do it better? We're just learning how biological organisms can do some pretty amazing stuff. Could we create some that would extract carbon and lay it down as diamond? Or better still, graphene and buckytubes. We'd finish up with fewer carbon atoms in the air, plus a useful endproduct. As I say, we're not there yet. But I hope somebody, somewhere, is working on it. The concerns over how much time we have left probably belong in a different thread. But if feedbacks do decrease our viability window then we need to accelerate our geoengineering research efforts. I think it's an avenue we have to investigate. Could we engineer a plant, such as a fast growing tree, so that it grew mass much faster? If so, we increase the potential of biochar or burying logs. Could we engineer plankton to reproduce/grow faster and take more carbon to the seafloor with their dead bodies? Abstract: "Changes of ocean ventilation rates and deoxygenation are two of the less obvious but important indirect impacts expected as a result of climate change on the oceans. They are expected to occur because of (i) the effects of increased stratification on ocean circulation and hence its ventilation, due to reduced upwelling, deep-water formation and turbulent mixing, (ii) reduced oxygenation through decreased oxygen solubility at higher surface temperature, and (iii) the effects of warming on biological production, respiration and remineralization. The potential socio-economic consequences of reduced oxygen levels on fisheries and ecosystems may be far-reaching and significant. At a Royal Society Discussion Meeting convened to discuss these matters, 12 oral presentations and 23 posters were presented, covering a wide range of the physical, chemical and biological aspects of the issue. Overall, it appears that there are still considerable discrepancies between the observations and model simulations of the relevant processes. Our current understanding of both the causes and consequences of reduced oxygen in the ocean, and our ability to represent them in models are therefore inadequate, and the reasons for this remain unclear. It is too early to say whether or not the socio-economic consequences are likely to be serious. However, the consequences are ecologically, biogeochemically and climatically potentially very significant, and further research on these indirect impacts of climate change via reduced ventilation and oxygenation of the oceans should be accorded a high priority. This article is part of the themed issue ‘Ocean ventilation and deoxygenation in a warming world’." Extract: “The project’s failure should cast serious doubts on the prospects of both “clean coal” as well as Bioenergy with Carbon Capture and Storage (BECCS) – the current star child of techno-fix solutions to climate change. BECCS would involve capturing CO2 from biofuel refineries or biomass-burning power stations and pumping it into geological formations, or – more likely due to economics – pumping it into oil wells in order to extract more oil. Despite lack of evidence as to the technological and economic viability of BECCS, the models underpinning the Paris Agreement’s 2°C target overwhelmingly rely upon BECCS as a “negative emissions technology” capable of being deployed at a scale large enough to balance out emissions by mid-century. The failure of the Kemper County project, which featured the cleanest and most efficient CCS power plant technology, should therefore be seen as a warning for policy-makers expecting CCS – including BECCS – technologies to magically close the emissions gap by mid-century. We may never find 'the one single silver bullet'. A combination of things like biochar, juicing up plankton reproduction, and several other partial fixes may be our route. We don't have to burn wood/wood waste in a gas turbine. We can burn biomass in converted coal plants. Even if we don't capture the carbon we are at least avoiding bringing more carbon into the above-surface carbon cycle. Biomass and biogas may be our best "deep backup" solution as battery storage gets very expensive when it's very seldom cycled. If we can figure out an affordable way to capture and securely store that carbon then we've turned biomass into one of our partial fixes. But of course this isn't what people want to hear. When you set out to cross the ocean it's a good idea to carry a lifeboat even if you think you may not need one. Title: "'Dodgy' greenhouse gas data threatens Paris accord"
Extract: "Air monitors in Switzerland have detected large quantities of one gas coming from a location in Italy. However, the Italian submission to the UN records just a tiny amount of the substance being emitted. These flaws posed a bigger threat to the Paris climate agreement than US President Donald Trump's intention to withdraw, researchers told BBC Radio 4's Counting Carbon programme. The rules covering how countries report their emissions are currently being negotiated. But Prof Glen Peters, from the Centre for International Climate Research, in Oslo, said: "The core part of Paris [is] the global stock-takes which are going to happen every five years, and after the stock-takes countries are meant to raise their ambition, but if you can't track progress sufficiently, which is the whole point of these stock-takes, you basically can't do anything. "So, without good data as a basis, Paris essentially collapses. It just becomes a talkfest without much progress."" "Another rare warming gas, carbon tetrachloride, once popular as a refrigerant and a solvent but very damaging to the ozone layer, has been banned in Europe since 2002. But Dr Reimann told Counting Carbon: "We still see 10,000-20,000 tonnes coming out of China every year." "That is something that shouldn't be there. "There is actually no Chinese inventory for these gases, as they are banned and industry shouldn't be releasing them anymore." China's approach to reporting its overall output of warming gases to the UN is also subject to constant and significant revisions." The Paris Accord is working. Countries made pledges and are now starting to present their data. Some of that data is being questioned, as should happen. That means that holes will get plugged because not meeting goals will be embarrassing. Now, are we moving as fast as we should be moving? Of course not. But we're moving faster than we were. Acceleration is a process. And the more we see that we aren't moving fast enough the more pressure will be applied to speed things up. We need to remember that we will not avoid hurt from climate change, we are already being hurt. It's all about reducing the amount of hurt. All good points Bob; however, my basic point is that most people are looking for a 'savior' (or 'magic bullet') so that they do not need to take responsibility themselves. This allows both decision makers and the media to over-play 'solutions' like Paris and geoengineering, which allows the majority of people to act like they have been 'saved' and so they do not need to take any further action. Thus teaching the majority of people how to be realistic about our current situation is the best geoengineering that there is. Edit: Even if Paris is working, per the attached graph of atmospheric CO2 concentrations at Mauna Loa, the rate of CO2 increase is the same as before Paris. We're not yet seeing a decrease in atmospheric CO2. We shouldn't expect to see any yet. It takes time for changes to show up in gross measurements. 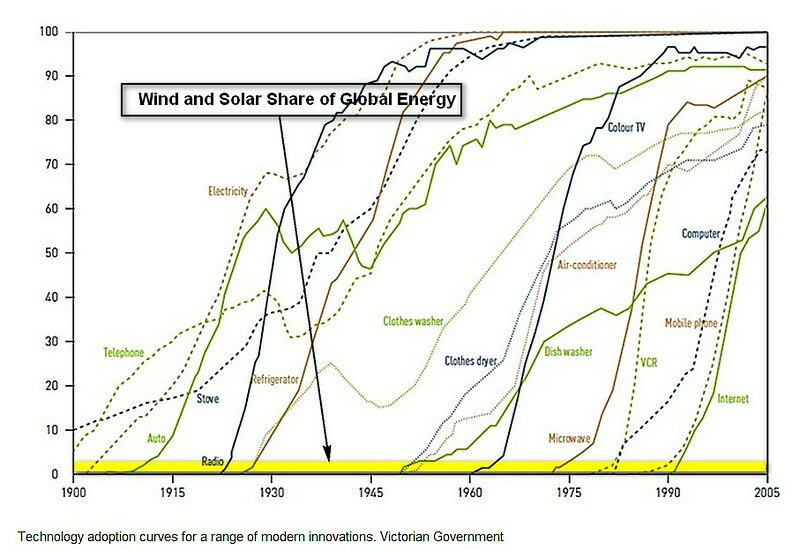 Look at where we are now and what we should expect to see as renewable energy and EVs enter the takeoff stage. That's when we see CO2 levels decelerate. We've assembled our armies, trained them and equipped them. Now we're ready to go into battle. We've created efficient and very affordable wind and solar technologies and now most of the world has learned something about our fossil fuels alternatives. We're launching more affordable EVs and should see EVs become cheaper to manufacture than ICEVs in less than five years. Here's our route to victory (IMHO). 1) We create our weapons. A job almost completed. 2) We alarm the populace. A job that has been mostly completed. Few people, globally are climate change deniers. Most people want something done. 3) We show people what can be done and done in ways that won't inconvenience them. Surveys have found that a majority of Americans want some action against climate change and are will to spend some money on fighting global warming - if it doesn't cost them too much. What we need to be doing now, and with great vigor, is to get the message out that renewable energy and EVs are a major weapon to fight climate change and - most importantly - by switching to renewable energy and EVs people will save money. Geoengineering. We need to greatly increase our research because we'd be idiots to go forth without trying to fit ourselves out with lifeboats. We do not yet fully understand the climate drivers that might appear as the planet warms. Even with our best efforts we might sail into a hidden rock and have to take emergency measures. Just don't talk about geoengineering as a solution. Talk about it as a last chance of survival that might save us if the worst happens. The linked article discusses how social science can be used to geoengineer society's resistance to address climate change (hint one focus should be on changing human behavior in order to reduce waste including wasted: food, energy and materials). Title: "Behavior Frontiers: Can Social Science Combat Climate Change?" By studying past instances of social transformation, scientists at Lawrence Berkeley National Laboratory (LBNL) hope to predict future change in response to global warming as part of California’s Carbon Challenge—a study commissioned by the California Energy Commission to help the state cut greenhouse gas emissions by 80 percent below 1990 levels. LBNL energy technology scientist Jeffery Greenblatt and his colleagues are analyzing technology options as well as data records from 10 historical behavior changes—smoking cessation, seat belt use, vegetarianism, drunk driving, recycling and yoga, among others." Abstract. "The fundamental role of the hydrological cycle in the global climate system motivates a thorough evaluation of its responses to climate change and mitigation. The Geoengineering Model Intercomparison Project (GeoMIP) is a coordinated international effort to assess the climate impacts of solar geoengineering, a proposal to counteract global warming with a reduction in incoming solar radiation. We assess the mechanisms underlying the rainfall response to a simplified simulation of such solar dimming (G1) in the suite of GeoMIP models and identify robust features. While solar geoengineering nearly restores preindustrial temperatures, the global hydrology is altered. Tropical precipitation changes dominate the response across the model suite, and these are driven primarily by shifts of the Hadley circulation cells. We report a damping of the seasonal migration of the Intertropical Convergence Zone (ITCZ) in G1, associated with preferential cooling of the summer hemisphere, and annual mean ITCZ shifts in some models that are correlated with the warming of one hemisphere relative to the other. Dynamical changes better explain the varying tropical rainfall anomalies between models than changes in relative humidity or the Clausius–Clapeyron scaling of precipitation minus evaporation (P - E), given that the relative humidity and temperature responses are robust across the suite. Strong reductions in relative humidity over vegetated land regions are likely related to the CO2 physiological response in plants. The uncertainty in the spatial distribution of tropical P - E changes highlights the need for cautious consideration and continued study before any implementation of solar geoengineering." We got rid of sulphate pollution because it was killing us, poisoning our lakes, and reducing agricultural output by dimming the sky. Why would we want to purposefully bring those bad things back? My read of Rignot et seq is that a tipping point has been reached. The only remaining question is how fast and how far will it tip. Nobody has yet found a reason why the whole thing won't eventually go assuming the current climate continues. "No amount of geoengineering" is obviously false, if we get there in time and vigorously enough. There might even be political will to freeze the ocean bottom and glue the glaciers in place within a couple years after the waters start to rise. Re: " ... political will to freeze the ocean bottom and glue the glaciers in place ..."
Will is one thing. Ability is another. The amount of heat involved is around 1e22 joule/yr. By contrast, the sum total of fluxes involved in all human constructed heat engines is about five or six orders of magnitude smaller. There is also the probability of economic and social chaos within many countries, even the richer ones, as the impacts of SLR, increased temperatures and general climate chaos take hold. We may lose the ability to put together the massive social and economic constructs required to carry out such large-scale geo-engineering. Governments may be more focused on immediate-term survival. My read of Rignot et seq is that a tipping point has been reached. The only remaining question is how fast and how far will it tip. I should have been more explicit to say that a 'main phase' collapse of the WAIS might likely begin by 2040 that, once triggered, could lead to a contribution to eustatic SLR of approximately 2m from the WAIS by 2100. In really bad times we might have to resort to something like this. Acid rain and crop yield decrease might be worse than extreme heat. Extreme heat could be worse for food production than dimming. Obviously this should be only a last resort sort of technique. But we need to build an arsenal of tools so that we can use them if necessary. Completely agree. That is why I don't expect geoengineering to actually happen. By the time it's needed due to major impacts of AGW, those same impacts will prevent its implementation. But we need to build an arsenal of tools so that we can use them if necessary. (b) Implement appropriate regulations on carbon emissions and on other pollutants. (c) Provide investment capital for green/sustainable energy/food production. (d) Apply restrictions on lobbyists who distort all of the above. Geoengineering leading to a reduction of incoming radiation will work to allow stored heat in the earth's oceans to be released, very very slowly. Since we are already seeing bottom melt in WAIS glaciers and much more heat will be absorbed before geoengineering occurs, it is certain that significant more melt will occur before temperatures equalize. The great unknown is what will happen to surface precipitation on land and, especially, Eastern Antarctica under a geoengineering scenario. If land-based precipitation increases significantly, it will offset much of the locked in SLR and cooling will work to reduce thermal expansion, eventually leading to contraction. At this point the very best we can hope for is another few feet of sea level rise within 50 years after Geoengineering is engaged, though there is very very high uncertainty. Those are not geoengineering tools. That's some of the stuff we could be doing that would reduce our possible need of geoengineering tools later on.